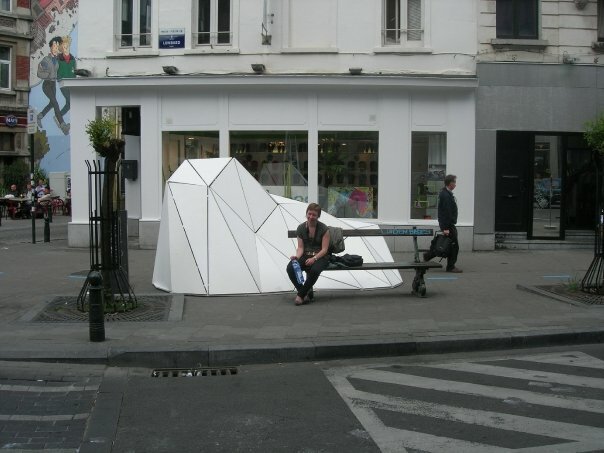 In 2008, the Brussels-based organisation “Zinneke” called for the design and realisation of street sculptures as a scenographic support for their parade. The design envisioned a group of icebergs as strange objects, loosely linked to the parade’s theme of water. These would be dispersed along the edges of a small crossing in the centre of Brussels. People passing through this space would see them, and might start to imagine the ground as water. The use of parametric software allowed for a rapid development of various esthetical iterations. These were tested by rendering and paper-folding models. Later stages included the simulation of panels and details in the model. Further optimisation then went into finding the necessary play between joints, avoiding problematic angles/layouts for construction, and keeping the triangles within the material size limitations. The final result was produced by CNC-machines from recycled strand boards, then painted, and put together using thin metal strips and a supporting inner structure and base. No rigid joints were used.